Critical Solar Lighting | Solar Panels | Solar Power | Site Map | Bookmark This Site! Ensure family safety and protect possessions with motion-sensor solar security lights. Quick, easy, wire-free installation and zero operating costs make solar security lights a great option for the home or business. What if it’s cloudy? Will my security light still charge? It’s never too cloudy to collect solar energy. Daylight conditions alone have a charging effect. 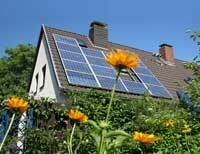 If there is good visibility, even in rain, a solar panel is able to collect and store energy. How much back-up do I need? The typical back-up built into most security lighting is 2-3 days. A well-designed solar lighting system can store sufficient energy for 5 or more consecutive days without bright sunlight. SolarHome.org offers a variety of environmentally conscious and cost-effective solar security lights for strong, full coverage. Call one of our friendly customer service representatives at 1-866-SUN-PRODUCTS (1-866-786-7763) to find a lighting solution today!